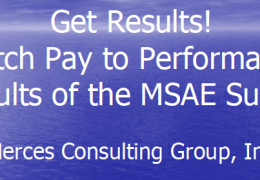 All of Merces consulting practices involve systems designed to maximize the effectiveness of the performance management process, and effective performance management can translate directly to effective pay. Organization design and job documentation ensures that jobs make sense, and that jobs are documented in such a way that they can be the forms used for performance management. 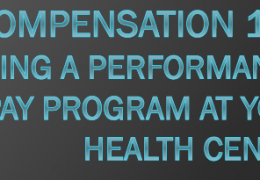 Merces’ compensation programs are designed to function with quality job descriptions and provide pay opportunities tied directly to employee contribution. While Merces concepts may be grouped under the definitions of “merit” pay, or “pay for performance,” we believe these concepts have lost their meaning over the years, and have been so laden with the baggage of poor program design, that new terminology is needed. Merces calls it “RightPay™” and it is the final step of the compensation management process. It is truly “pay for contribution” because this method assesses the value, or “price tag”, of employees based on their proven ability to perform the responsibilities of their job. With performance management focused on employees’ actual jobs, and pay ranges that accurately reflect the value of the job to the organization and in the market, the pay for contribution approach determines what part of the range is appropriate for the employee in a given year. The focus is not on “what increase should be given?” but “what should pay be?” The actual amount of the increase is an afterthought. 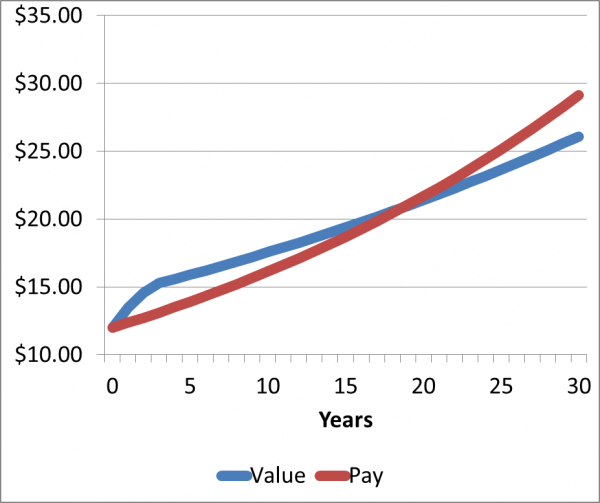 This graph illustrates the “value” of an employee in the market, and compares it to the pay the employee would receive in the “typical” compensation program. Because the market is continually in motion, employers must recognize both employee growth and market growth, which most programs cannot manage to do within the established budget mind-set. With typical market growth of 2% over time, and compensation adjustments averaging 3% over time, most compensation programs will take nearly 20 years to have employee pay catch up to market value – for the first 20 years or so, other employers will pay more, and the organization is at risk of losing an employee, after that, an employee’s pay will exceed value, resulting in misallocation of scarce resources. Merces approach focuses on establishing the price tag of each employee, and showing organizations how to set pay at that level, while still remaining within the constraints of its cost structure.